Now a major motion picture from Clint Eastwood, starring Tom Hanks-the inspirational autobiography by one of the most captivating American heroes of our time, Capt. `Sully' Sullenberger-the pilot who miraculously landed a crippled US Airways Flight 1549 in New York's Hudson River, saving the lives of all 155 passengers and crew. 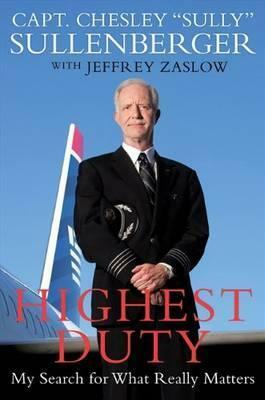 Sully's story is one of dedication, hope, and preparedness, revealing the important lessons he learned through his life, in his military service, and in his work as an airline pilot. It reminds us all that, even in these days of conflict, tragedy and uncertainty, there are values still worth fighting for-that life's challenges can be met if we're ready for them. Now a major motion picture from Clint Eastwood, starring Tom Hanks--the inspirational autobiography by one of the most captivating American heroes of our time, Capt. 'Sully' Sullenberger--the pilot who miraculously landed a crippled US Airways Flight 1549 in New York's Hudson River, saving the lives of all 155 passengers and crew. Sully's story is one of dedication, hope, and preparedness, revealing the important lessons he learned through his life, in his military service, and in his work as an airline pilot. It reminds us all that, even in these days of conflict, tragedy and uncertainty, there are values still worth fighting for--that life's challenges can be met if we're ready for them. Chesley B. "Sully" Sullenberger, III has been dedicated to the pursuit of safety for his entire adult life. While he is best known for serving as Captain during what has been called the "Miracle on the Hudson," Sullenberger is a speaker, aviation safety expert, and accident investigator, serves as the CBS News Aviation and Safety Expert, and is the founder and chief executive officer of Safety Reliability Methods, Inc., a company dedicated to management, safety, performance, and reliability consulting. He lives with his family in the San Francisco Bay Area. Jeffrey Zaslow was a Wall Street Journal columnist, and, with Randy Pausch, coauthor of The Last Lecture, and the author of The Girls from Ames. Zaslow died in 2012 at the age of 53.